Danish rock trio Mew are something of an enigma. For a band with a knack for writing blazingly brilliant guitar based pop songs, they seem wilfully determined to subvert any chance of mass acceptance. Whether it be their career long flirtation with a deeply unfashionable strain of Prog Rock, their penchant for bizarrely opaque song titles or their weirdly compelling live shows, they do not make it easy for the uninitiated. And yet those who fall for Mew, fall hard. Mew acolytes are a steadfast and loyal bunch; every new release is greeted with a universally rapturous response. Seventh album Visuals is the first album recorded without founding member and guitarist Bo Madsen. His departure in 2015 may have left some fans anticipating this new album with some trepidation – they need not have worried: Visuals is an absolute treat, sprinkled with that rare Mew magic that makes them so unique. Their prog rock leanings are still very much in evidence – the spangly synths, the big, accented power chords and cheesy drum rolls all part of the sonic stew, but beneath it all, their ability to create bold and beautifully dreamy rock music remains. The sharp edged pop of ‘The Wake of Your Life’ overflows with melodic goodness while ‘Ay Ay Ay’ has that epic, whimsical Mew-ness that they conjure up so well. ‘Carry Me To Safety’ is lighters in the air, full on, bombastic greatness that, in the hands of lesser bands (Coldplay), would sound cringe worthy. But Mew carry it off with aplomb, straddling the line between earnest sincerity and Spinal Tap grandiosity without batting an eyelid. 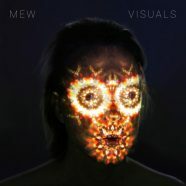 If you haven’t already been drawn into the strange and beautiful world of Mew, ‘Visuals’ is as good a place as any to start exploring.